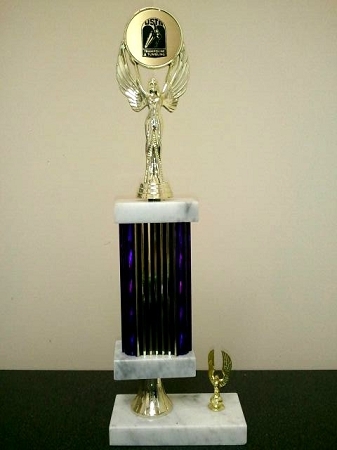 Celebrate your winners in style with your business, organization or event logo featured on the top of the trophy. We add your logo (just upload your .jpg image) on to a metal disk. Artwork can be full color or single color art. The trophy is made of Italian marble and vintage recycled materials from the Trophy Recycling Program. Choose your column color. No two trophies are exactly the same as columns are selected from a vast array of styles. Includes standard engraving (50 characters) on a black brass plate. Please allow 7-10 business days production time.